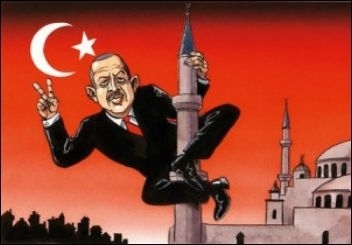 "The bitter truth is that Turkey is too oriental for the European Union, too non-Arab for the Arab League, too non-African for the African Union, too irrelevant for ASEAN and the Union of South American Nations and too western for the Shanghai Cooperation Organization ('The Shanghai Seven?' Feb. 8, 2013)." Before Prime Minister (then Foreign Minister) Ahmet Davutoğlu failed to foresee that spring could also blossom on the Arab Street, he was busy masterminding what looked like a "Middle East Steel and Coal Union" – with, of course, Turkey as its leader. It was the moment to feel imperial again! Borders between the region's Muslim "brothers" would disappear "a la Schengen." Trade would prosper (indeed, it did). Sunni Islamists would be the emerging Turkish empire's own "commonwealth of nations." Systematic doses of Israel-bashing could always suffice to keep Shia Iran, Shia Hezbollah and Nusayri-ruled Syria docked at the Turkish bay. The failed state Somalia was easy to win with stacks of dollars and – part-time – common faith. And the Maghreb could wait. "We believe that [world peace] can only be achieved through a Turkish Islamic Union, where all the countries will be independent in their [local governance], but they will be under one roof, and Turkey will be the spiritual leader of this Turkish Islamic Union." Thus wrote a Turkish journalist in 2012, reflecting the illusions of grandeur more honestly than what the very important men in Ankara had rather more subtly in their minds. For the Shia in Lebanon, Mr. Erdoğan is no longer the "rock star" he was a few years earlier. Too bad, he will remain a potential enemy even if he declares war with Israel. Libya is too war-torn and busy to care about any union, Turkish, Islamic, or both. Egyptians, until last week, were fuming at anything Turkish, including consumer goods and even soap operas. Last week, they took governmental action to raise the stakes in their cold war with Mr. Erdoğan's Turkey, when Cairo announced that it would not renew a three-year transit trade agreement with Turkey. The Turkish Islamic Union must now remain in deep freeze for a few more decades before a new generation of Turkish Islamists give it another try. Ironically, the Egyptian move will leave only one option for the Turkish trucks: An alternative Ro-Ro Line between Iskenderun and the Israeli port of Haifa to transport exports to countries on the Arabian Peninsula and Jordan. So, Israel has become a part-time partner: Ideological enemy and pragmatic ally. Echoing Cairo last week, Iran's ambassador to Ankara, Ali Reza Bigdeli, said Iran would not sell fuel to Turkish trucks due to the way Ankara responded to a transit fee and fuel row with Tehran. That was not very "brotherly," but very "Middle Eastern." On the western near-end of the would-be Turkish Islamic Union, Ennahda, the first Islamist movement to secure power after the 2011 Arab Spring revolts, has conceded defeat in elections to its main secular rival, Nidaa Tounes. The election was a huge setback for Mr. Erdoğan's Tunisian ideological allies. The Middle East Steel and Coal Union, the Turks' shrewd idea before they upgraded it to the Turkish Islamic Union, must now remain in deep freeze for a few more decades before a new generation of Turkish Islamists give it another try. But if Messrs. Erdoğan and Davutoğlu are in a rush to see a great Turkish-led union of noble nations, they could always thumb their noses at the Shanghai Six and invent "The Middle East Two-And-a-Half," bringing together Turkey, Qatar and Hamas.